If you are Alain Silberstein and the eighth anniversary of your eponymous company is coming up, what do you do to celebrate the occasion? Well, you’re looking at it. 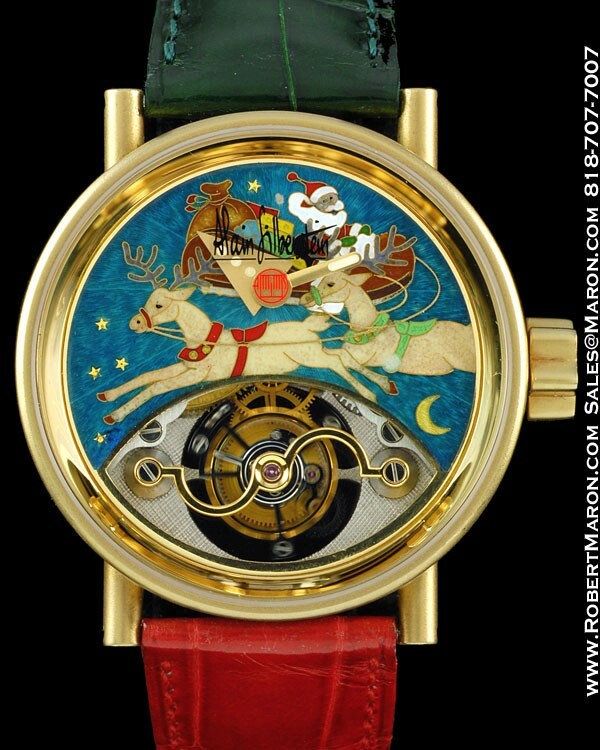 A piece unique 18k gold tourbillon with Santa Claus and his reindeer cloisonné, off center time display and one minute tourbillon. If you are a Silberstein collector, this is a must have watch! The 18k gold case is the classic Silberstein shape, round with straight tubular lugs, thick bead blasted mid case, and display crystals front and back. The crown is 18k gold in the shape of a six sided star, with a black enamel triangle inlaid. Dimensions are 38mm diameter by 11mm thick. “PIECE UNIQUE” and “1/1” are both engraved in the gold on the rear bezel. Dial is just fantastic. 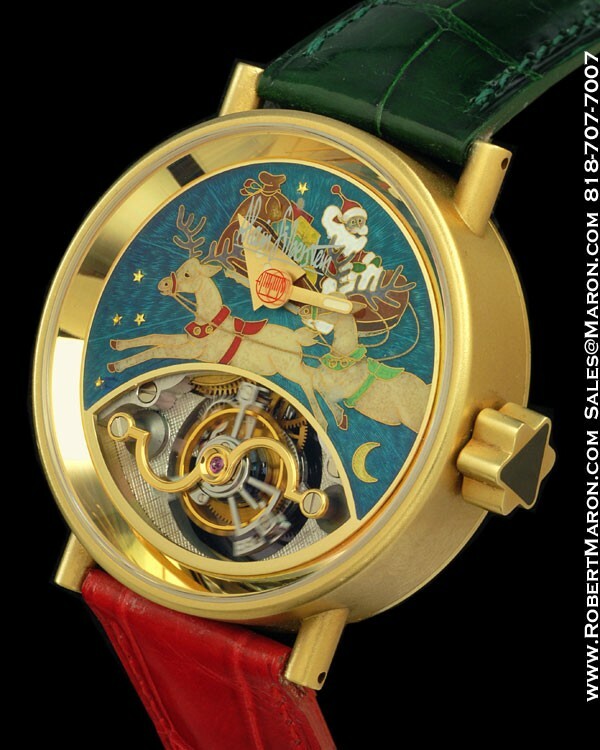 The cloisonné has a turquoise background, with Santa Clause, his reindeer, sleigh and bag of gifts in the center, along with some stars and the moon. The time is displayed with a large triangular hour hand and oval shaped minutes hand. 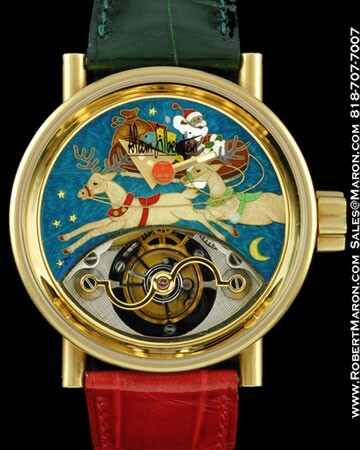 The time display is off axis on top of the Santa Claus design. The lower part of the dial is cut away to show the one minute tourbillon rotating. 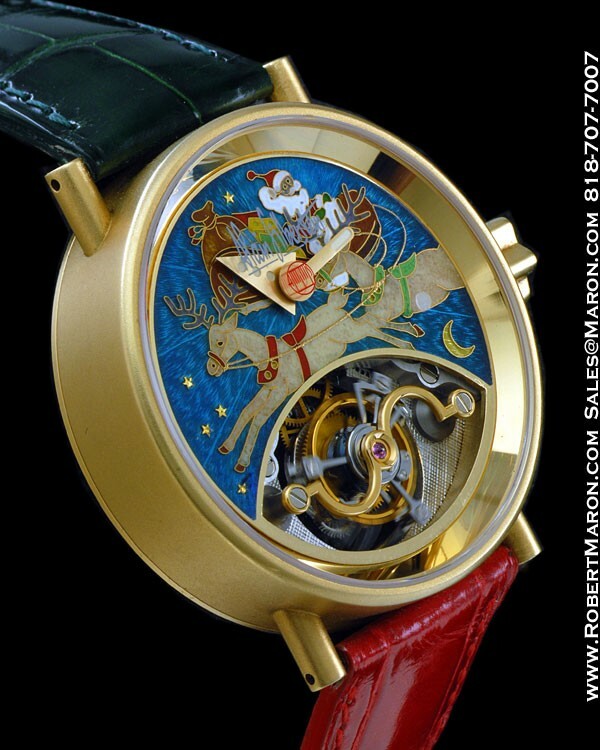 Movement is manual winding with 21 jewels and adjusted in five positions. The movement is inscribed with: “No. 08 Annee 1994”, the Alain Silberstein logo and the technical details of the caliber. 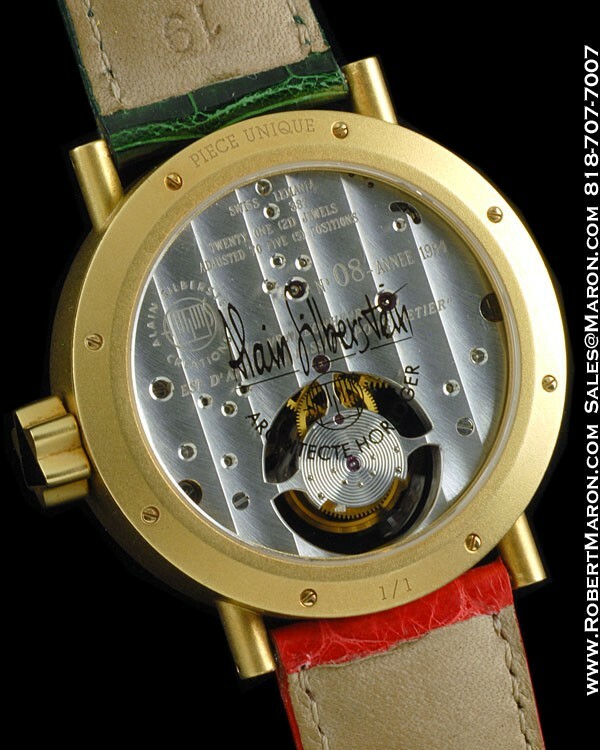 “Alain Silberstein Architecte Horloger” is etched into the display crystal. Strap is red crocodile on one side and green crocodile on the opposite side with 18k gold A.S. buckle.